Ready to dig in? 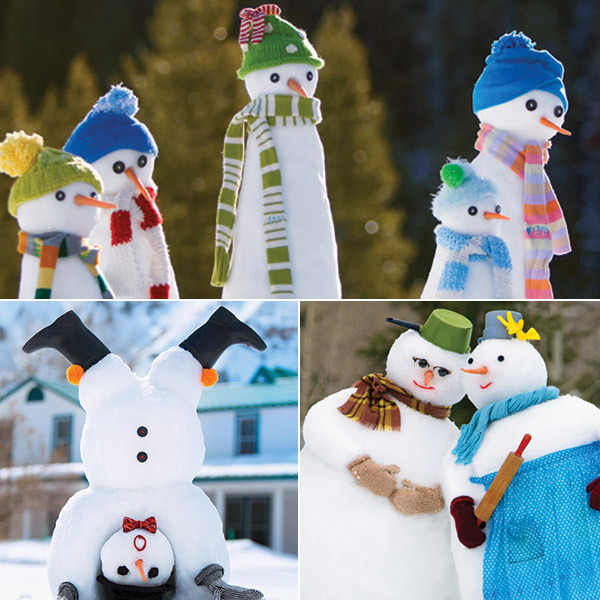 Choose your favorite snowmen below, gather the supplies listed and get ready to let the good times roll! 1. 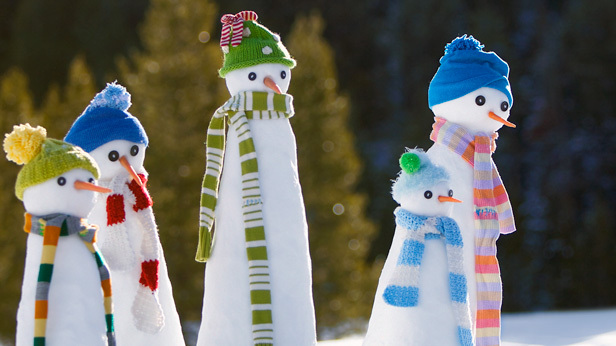 Make a bunch of 8-to-12-inch-tall snowballs. Stack them in towers and use slush to fill in the gaps and create smooth, narrow bodies. Let your towers tilt and lean for a more whimsical effect. 2. Add a 6-to-8-inch-tall ball (or whatever size will fit your hats) to each tower to create a head. 3. Wrap on a long scarf, or cut thrift-shop sweaters into long strips and sew together, to make Dr. Seuss–like scarves. 4. Thread a pipe cleaner through each button and insert the button eyes into each head. 5. Add a carrot nose and top with a hat for each snow person. 1. To create the bodies, make two very large egg-shaped snowballs, about 3½ feet across by 4½ feet tall. Build them close together so they lean toward each other near the top. 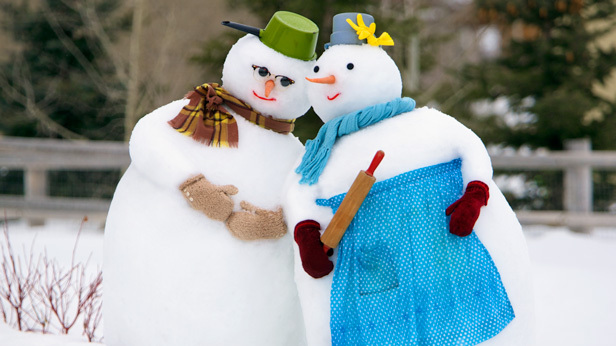 Tie the apron onto the woman, and pack snow on each body to create arms. 2. Make a large head (about a foot across) for each, and top each head with a pot for a hat. Tie the rubber glove onto the handle of the woman’s hat to form a flower. 3. Fill the mittens with snow, then hold one in position against the body. Poke a wooden skewer through the mitten and into the body to secure it in place. Repeat with other mittens. 4. Twist pipe cleaners around one end of the rolling pin, leaving the ends long so that you can stick them into the snowball body to secure. 5. Give each snow person a scarf, glasses and/or coal eyes, a licorice mouth and a carrot nose. 1. Place the chair where you want the snowman to be in your yard (large snowballs are heavy, so you don’t want to move it later!). 2. Roll a large ball to be the belly, about 2½ feet tall, and place it on the chair. 3. Pull the boxers over the ball with the leg openings toward the bottom, removing the elastic if necessary. Line up a row of smaller balls (or chunks) at the leg openings of the boxers and smooth them together to form the legs. Add a bit on the end of each for the feet. 4. Add a smaller ball on top of the body for the head. Position the carrot nose and the sunglasses, and make a mouth of licorice. Add the hat. 5. Make arms by smoothing a few smaller balls on either side of the belly. Nestle a frosty drink near the end of his arm and garnish with fruit. Put a few rocks in the cup to keep it from blowing away. 1. 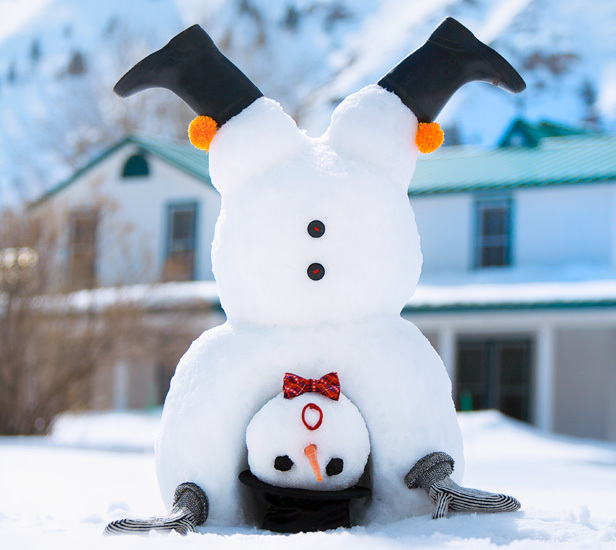 Make a classic three-ball snowman, with the bottom ball about 2½ feet tall. 2. Push the sticks into the center snowball for the arms, and put the mittens on the ends. Place the skates, if using, over one shoulder, tying one lace around the neck. 3. Cut two sets of 12 yarn strands (about 8 inches each). For each set, tie one end together and braid strands. Thread a pipe cleaner through each set so 2 inches of pipe cleaner stick out of the top of each braid. Use that end to insert the braids into the back of the head. Bend the braid into a U shape. 4. Add the coal for eyes and a carrot nose. Put on the hat and scarf. 5. To make the dog, start with a 1-foot snowball for the midsection. Add a slightly larger ball in front (for the upper torso) and a smaller ball on top for the head. 6. Scoop out eye sockets so that the eyes will be deeply inset, and add snowballs to make the ears and a snout. 7. Add the coal for eyes and a rock for the nose. 8. Pack snow in the shape of front legs, and add a tail in the back so it appears to be wagging. 9. Place the belt around the neck as a collar. 1. Make one snowball, about 3 feet tall, for the arms. Place a smaller ball, about 2½ feet tall, on top for the belly. 2. Make two balls for the legs and one for the head, each about 1 foot tall. 3. Scoop out the front of the bottom ball to make an opening for the head. Smash the hat down slightly, tuck it into the niche you created, and place the head on top of it. 4. Add the legs and push a stick into each ball to hold the boots. Attach the pom-poms to the boots with the safety pins and place the boots over the sticks. 5. Fill the mittens with snow and shape them into position. 6. Thread a pipe cleaner through each button’s holes and stick the pipe cleaner into the belly. Use the same method to add the bow tie to the neck. 7. Add the coal for eyes, make a round mouth out of the licorice, and add a carrot nose. Are you a rookie? 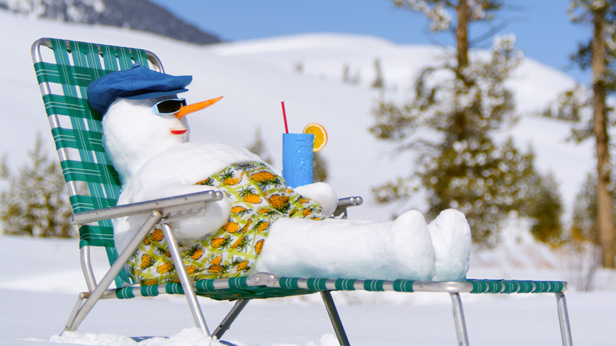 A few helpful tips will turn you into a master snowman builder! Start by rolling a batch of snowballs in different sizes, and store them in a shady spot until you’re ready to construct. Use wet snow for the best results. The snow is wet enough if you’re able to form a nice, round snowball easily. If the snow is too dry to make a nice ball, mix snow and water in the bucket until you have a good slush. Add it to transform your powder into packed balls, or use it like cement to help connect, smooth and sculpt your snowballs into shape. If the sun comes out and starts to melt the snow you are using, dig a hole to reach the snow that’s closest to the ground (where it’s colder). When you’re stacking balls, flatten and loosen the snow on top of the bottom ball so that the top ball has something to stick to. After you’ve placed the top ball, twist it back and forth to make it sturdier. 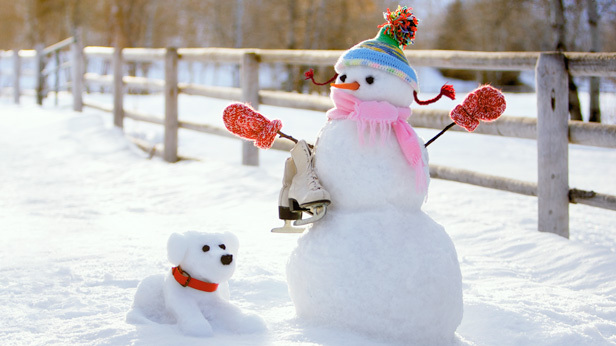 Always fill your snowman’s mittens and hats with a bit of snow—it gives them shape and keeps them from blowing away. To accessorize, many things can work. But consider sticking to carrots for noses. Straight, crooked, curved, short, long, fat or thin, they’re the classic element that completes the snowman’s personality.